Most of the cases filed over the killing of bloggers, publishers and freethinkers by suspected militants are almost stuck at investigation or at trial levels. Families of the victims are frustrated with the slow progress in investigation or trial in the cases. Government officials concerned had promised to ensure justice after every incident but the sensational blogger murder cases are seeing almost no progress. 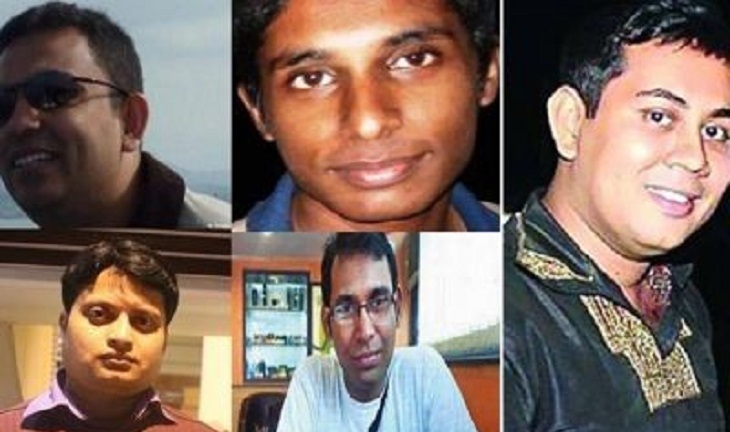 Since the Shahbagh protest in 2013 demanding capital punishment for war criminals, at least 10 bloggers and freethinkers have been killed by militants across the country. Of the cases over the murders, eight were filed with different police stations in DMP where investigations in the cases are yet to be completed. A group of four youths stabbed to death blogger Niladri Chattopadhyay, alias Niloy, 40, inside his flat at East Goran in the capital on August 7, 2015. Police have been conducting investigation for more than three and a half years, but are yet to complete the probe and submit charge sheet in the case. Some 13 members of ABT were arrested in connection with the case, but seven of them have already secured bail from the High Court. On April 25, 2016, suspected militants killed LGBT magazine editor Xulhaz Mannan and his friend, Mahbub Rabby Tonoy at the former’s Kalabagan resident in the city. But the CTTC unit of DMP failed to submit the probe report on 21 scheduled dates in the last three years. In the latest development, CTTC arrested Ansarullah Bangla Team (ABT) member Asadullah, alias Fakrul, alias Faisal, and he apparently confessed to his involvement after six days on remand in two phases. So far, police have arrested six ABT members in connection with the case, and five of them have given confessional statements where they said the attack was also the brainchild of sacked major Syed Ziaul Haq who is top militant leader. Investigations into cases filed over the murder of online activist and Jagannath University student Nazimuddin Samad on April 2016 is also yet to complete. Police have arrested eight ABT men in connection with the Samad killing, but the investigator is yet to submit charge sheet in the cases. Dhaka chief metropolitan courts are fixing date one after another asking the investigators to submit probe report before the court. The trial is yet to be started in the case filed over the killing of writer and blogger, Avijit Roy, and injuring his wife even four years after the incident. On February 26, 2015, militants killed Avijit, and injured his wife after the couple came out of Ekushey Boi Mela on the Dhaka University campus. After four years of investigation, police submitted a charge sheet against six people, including sacked army officer Syed Ziaul Haq and “extremist” blogger Safiur Rahman Farabi in the case on March 14. The couple’s family members have expressed dissatisfaction with the slow progress of the investigation on several occasions. DMP’s CTTC unit Inspector Md Monirul Islam, also investigation officer (IO) of the case, said a total of 11 members of ABT were involved in the killing mission. Of them, six took part directly. “We could not trace the others,” the IO said. Meanwhile, the trial is yet to be started in another case filed over the killing of Jagriti Prokashoni publisher Faisal Arefin Dipan. He was a friend of blogger Avijit Roy and published one of his books. Dipan was hacked to death inside his office at Dhaka’s Aziz Super Market, allegedly by the members of banned militant group Ansar al-Islam on October 31, 2015. Detective Branch (DB) of police submitted a charge sheet in November last year accusing eight members of ABT in the case. Police claimed that sacked army major Syed Ziaul Haq was also the mastermind of the attack. Trial of blogger Oyasiqur Rahman Babu murder case is going on slowly with a Dhaka court due to negligence of the authorities concerned and non-appearance of witnesses. Oyasiqur, also a 27-year-old travel agency executive, was killed in the capital’s Tejgaon area as he was on his way to office in Motijheel on March 30, 2015. Cleaver-wielding Zikurullah and Ariful, who are madrasa students, were chased down by locals while they were fleeing after hacking Oyasiqur to death. On September 2, 2015, Detective Branch (DB) of police submitted a charge sheet against five militants in the case. But the trial is not complete in the last three and half year in the case. A total of 22 out of 40 prosecution witnesses testified before the court in the case till now. Meanwhile, the trial in the case filed over the killing of secular blogger Ananta Bijoy Das is also going at a snail’s pace with a Sylhet court. Ananta was hacked to death by suspected militants near his home at Sylhet’s Subid Bazar neighbourhood on May 12, 2015. On May 8, 2017, CID submitted supplementary charge sheet against six persons while the trial in the case started on May 23 with Sylhet Metropolitan District and Sessions. On April 2, 2017, the High Court upheld a speedy trial tribunal verdict that sentenced two people to death for killing blogger Ahmed Rajib Haider in the capital. On December 31, 2015, a Dhaka court awarded death penalty to Md Faisal Bin Nayem, alias Dweep, and former Shibir leader Redwanul Azad Rana for masterminding the blogger’s murder. The court sentenced six others to various terms of imprisonment for the murder, including a five-year term for Ansarullah spiritual leader Mufti Jashim Uddin Rahmani. Rajib, an activist of Shahbagh, was hacked to death in Pallabi area of capital on February 15, 2013. Chief public prosecutor of Dhaka Metropolitan Sessions Judge Court Md Abdullah Abu said the trial proceedings in blogger Oyasiqur killing case is slow due to non-appearance of witnesses. About the delay in investigation, DMP Deputy Commissioner (Media) Masudur Rahman recently said they submitted charge sheets of most of the cases filed over the killing of bloggers and the charge sheet in remaining cases will be submitted soon.